5 UNUSUAL WEDDING THEMES TO AMAZE YOUR GUESTS! Weddings are often the end result of months, even years, of planning. All of the details have to be considered to create a day that is as special and magical as possible. There are hundreds of ‘tried and tested’ ideas to choose from but how about something really unusual and completely personal to you? At The Insurance Emporium, we want your day to be as unique as you are! That’s why we’ve put together this guide on unusual wedding themes to try and help inspire you! 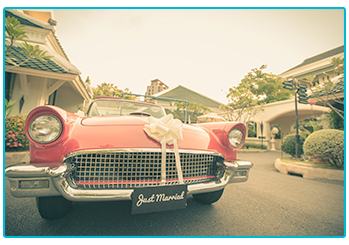 Vintage nostalgia is popular, fun and could be something that, if injected into your day effectively, might make your wedding a cut above the rest! You could go back to the 50s with big, bouncy dresses, bright lipstick and a milkshake bar to create a diner feel. If the 1950s isn’t far enough back, how about a medieval wedding? Turning your reception into a huge feast with jugglers, jesters and even a lute player could be the perfect throwback (and back a bit further) wedding! Hogwarts School of Witchcraft, Wizardry… and Weddings! There’s no doubt that the Harry Potter phenomenon has absolutely swept the world since the release of J.K Rowling’s first book and resulting movies. This has now gone well beyond the big screen and into the world of weddings! There are various Potter-themed touches that you could add to the day, such as the colours of your favourite house, wands or chocolate frogs as favours, serving up your own ‘Butterbeer’ and much more. If your passion in life is binging on a box-set then you might want to bring this into your wedding theme. Bringing a new meaning to “until death do us part”, a zombie themed ‘The Walking Dead’ wedding could be right up your street, just be prepared for a different kind of wedding makeup! ‘Game of Thrones’ has been one of the most popular TV shows of recent years. With all kinds of costumes, braided hairstyles and, of course, ceremonial swords to use (you might want to make sure that your policy covers these), this could be an inspired tribute to your favourite TV show! Let’s just hope that it doesn’t end up like the ‘Red Wedding’! Whether it’s in comic books or big-budget Hollywood movies, superheroes are big business these days! If you want to show guests that you’re barmy for Batman or wild for Wonder Woman then this could be the wedding theme for you! Adding a few flashes of superhero inspiration to the outfits could be ideal, even donning a cape or a hero t-shirt under your attire! Arranging the tables into superhero names and having themed cocktails could set the day off perfectly. Sipping on a ‘Thor’s Hammer’ sounds like it might be the recipe for a good time! If you’re planning a summer wedding, taking inspiration from a music festival such as Glastonbury could be a great option for the music lovers out there! 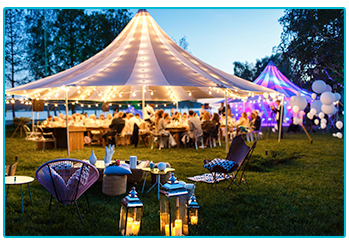 Hiring a big marquee or tepee and getting some live music could help to create the ultimate festival feel! You could also hand out festival-style lanyards for your guests with the day’s events and timings on and why not name the tables after famous stages or musicians? Your own ‘Weddingstock’ could lead to a marvellous musical matrimony! Whatever your passion in life, there are plenty of ways to have a wedding day that reflects your personality! Whilst you’re planning your day, you might also want to consider some Wedding Insurance to cover you in the event that the unforeseen happens! At The Insurance Emporium, our Wedding Insurance policies have a choice of Elective Benefits to choose from, such as Ceremonial Swords cover*, and are available with a simple one-off payment from £17! Check out The Insurance Emporium today to find out more! 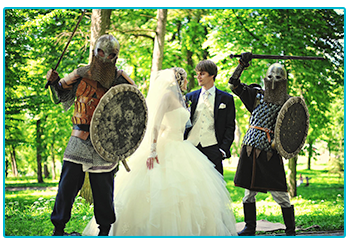 *Ceremonial Swords cover only available on UK Wedding policies. This blog is in no way sponsored, endorsed or administered by, or associated with wizardingworldpark.com.